The sky on Feb. 17 at 6:30 pm local time from midnorthern laitudes. Once again it is time to seek out what has often been cited as the most difficult of the five brightest naked-eye planets to see: Mercury. I personally feel that the oft-used moniker, "the elusive planet," is not a fair one, because it gives the impression that in actually seeing Mercury is a major accomplishment. While that is certainly true most times of the year, there are other occasions-and this is one of them-where making a Mercury sighting requires almost no effort. You simply must know when and where to look, and find a clear western horizon. Mercury is also called an "inferior planet" because its orbit is nearer to the Sun than the Earth's. Therefore, it always appears from our vantage point to be in the same general direction as the Sun. I've always loved this analogy for Mercury found in the 1941 classic, "New Handbook of the Heavens" by H.J. Bernhard, D.A. Bennett and H.S. Rice: "Mercury stays close to the Sun like a child clinging to its mother's apron strings." Thus relatively few people have set eyes on it; there is even a rumor that Copernicus, never saw it. And yet it's really not hard to see. For those living in the Northern Hemisphere, we're currently in the midst of a fine "window of opportunity" for viewing Mercury in the evening sky. That window, which will probably close for most after March 3, will provide good chances to see it with your own eyes during these next two weeks. 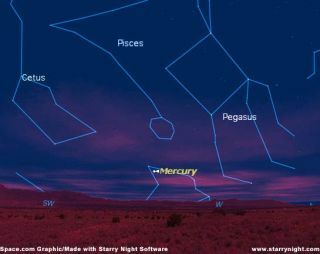 Currently, Mercury is visible about 45 minutes after sunset, very near to the horizon, a bit to the south of due west. But, if your sky is clear and there are no tall obstructions to your view (like trees or buildings) you should have absolutely no trouble in seeing it as a very bright "star" shining with just a trace of a yellowish-orange tinge. Currently, Mercury is shining at a very bright magnitude of -1.0. In fact, among the stars and planets, Mercury now ranks a very respectable fourth, behind Venus, Jupiter, and Sirius (the brightest star). In the evenings that follow, Mercury will diminish-slowly at first -- in brightness, but it will also be arriving at its greatest elongation, 18.1º to the east of the Sun, on February 24. Shining at magnitude -0.3, Mercury will appear as a very bright solitary "star," low in the western sky and setting more than 1½ hours after the Sun-just after evening twilight has ended. As a result, this will be Mercury's best evening apparition of 2006. Through telescopes, Mercury, like Venus, appears to go through phases like the Moon. Just a week ago, when Mercury starting appearing in the western twilight sky, it was a nearly full disk (92 percent illuminated), and shining nearly as bright as Sirius. By the time it arrives at its greatest elongation, it will appear roughly half-illuminated and the amount of its surface illuminated by the Sun will continue to decrease in the days to come. So when it begins to turn back toward the Sun's vicinity after February 24, it will fade at a rather rapid pace. In fact, by the evening of March 3, Mercury's brightness will have dropped to magnitude +1.5; only a trifle brighter than Castor in Gemini and only 1/10 as bright as it is now. In telescopes it will appear as a narrowing crescent phase, its disk only 16 percent illuminated. In all likelihood, this will be your last view of it, for the combination of its rapid fading and its descent into the brighter sunset glow will finally render Mercury invisible before the end of the first week of March. A challenging observation awaits you on the evening of February 28, when an exceedingly thin crescent Moon-only about one day past new phase-sits only about 5½º below and slightly to the left of Mercury (your clinched fist held at arm's length measures about 10º). Use binoculars to aid in your search. By the following evening (March 1) it will be much easier proposition to see the Moon; it now will be riding about 11º above and to the left of Mercury. In old Roman legends, Mercury was the swift-footed messenger of the gods. The planet is well named for it is the closest planet to the Sun and the swiftest of the Sun's family, averaging about 30 miles per second; making its yearly journey in only 88 Earth days. Interestingly, the time it takes Mercury to rotate once on its axis is 59 days, so that all parts of its surface experiences periods of intense heat and extreme cold. Although its mean distance from the Sun is only 36 million miles, Mercury experiences by far the greatest range of temperatures: nearly 900ºF./482ºC. on its day side; -300ºF./-184ºC. on its night side.